As we are counting down the days until Christmas, I thought, "Why not do a countdown Ten Things of Thankful post--featuring numbers?" So pull up a seat, and get set to read! 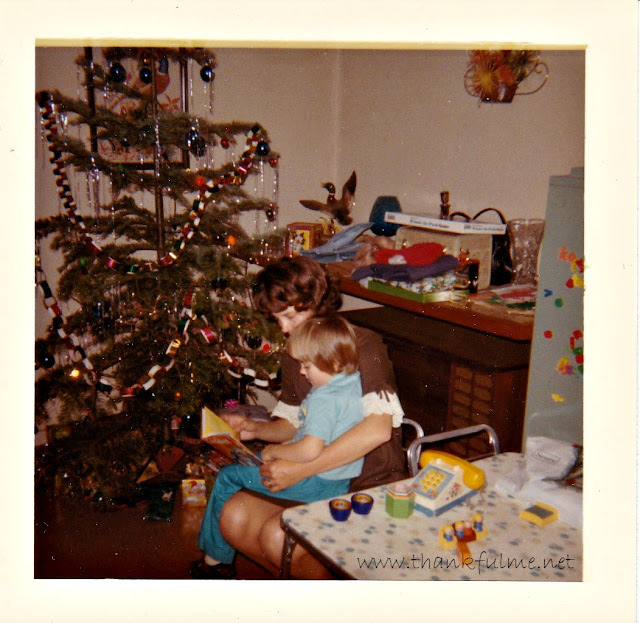 Photo: A much-younger me sits on my mom's lap as she sits on a child-sized chair and reads me a story. A Christmas tree, adorned with paper chains, tinsel, and glass balls, stands in the background. 10. I'm thankful for ten more days until Christmas to finish preparations. 9. I'm thankful for the nine different wards (church congregations) John and I have been in since we've been married. 8. I'm thankful for eight years spent in our last house. 7. I'm thankful for our seventh home purchase, the one we will be moving into sometime next year. 5. I'm thankful for five wonderful children. 4. I'm thankful for four fantastic grandchildren. 3. I'm thankful for my grandma, who will turn 101 years old in three weeks! 1. I'm thankful for one amazing husband. What are you thankful for this week? Join up at the Ten Things of Thankful blog, and/or comment below! An excellent countdown of thankfuls, and i hope you have a wonderful Saturday! Thank you! I hope you had a good weekend, too. I like your number theme. Excellent things to be thankful for. How blessed you are to still have your grandmother. I recognize that not many people my age still have any of their grandparents around. I truly am fortunate. I think you're right about Drexel. Great list! Have a wonderful holiday!